How many times have you wished you can turn back the hands of time or undo a decision or an event? The reality is that life has no undo button and the earlier we wake up to that reality the better. You can’t unbreak a heart, you can’t undo what has happened, you can’t go back in time and make some decisions all over again, what is done is done. Don’t live your life looking for way back, it is only a waste of time, there is no way back only way forward, if you don’t want to be stranded. So you got pregnant while you are still in secondary (high) school, so what? You can’t live your life bemoaning that single mistake. An error in judgement doesn’t mean all has to stop, it only means you have to re-strategize and maybe go it a harder way. Or you went bad and got rusticated from school or worse you ended up doing time for what you are not guilty/guilty of but that shouldn’t be the end of your story, people have moved from pits to pulpits, grass to grace and zero to hero however, the worst thing you can do to yourself is to spend time wishing you can undo the past because sir and ma, what is done is done. You should find the strength to move on, so you don’t get left behind. Pregnant at 18 or childless at 48, you can still have whatever you desire, one single error in judgement or a yet to be answered prayer can’t stop who or what you are meant to be, it is always yours to decide! So you had an accident or worse incapacitated from birth, this doesn’t mean it is over, trust me life has just began, you can still make it work, check history. So you had enough before then lost it all or wasted it, believe me, even the prodigal son knew, you can always retrace and restart. In life, there is a big difference between ‘can’t’ and ‘won’t’; most things we say we can’t do are just things we won’t do because we are too scared of failing, yet wishing there could be another way but the hard way. You can’t unsay the hurtful words you said to someone but you can show how sorry you are to calm their aching nerves, people forgive! You can’t unlive the kind of rough life you had lived in the past but you can make a choice never to go back to it. You can’t go back in time to make amends for the evil you had done to people who genuinely loved you but going forward, you can be the success they all want you to be. 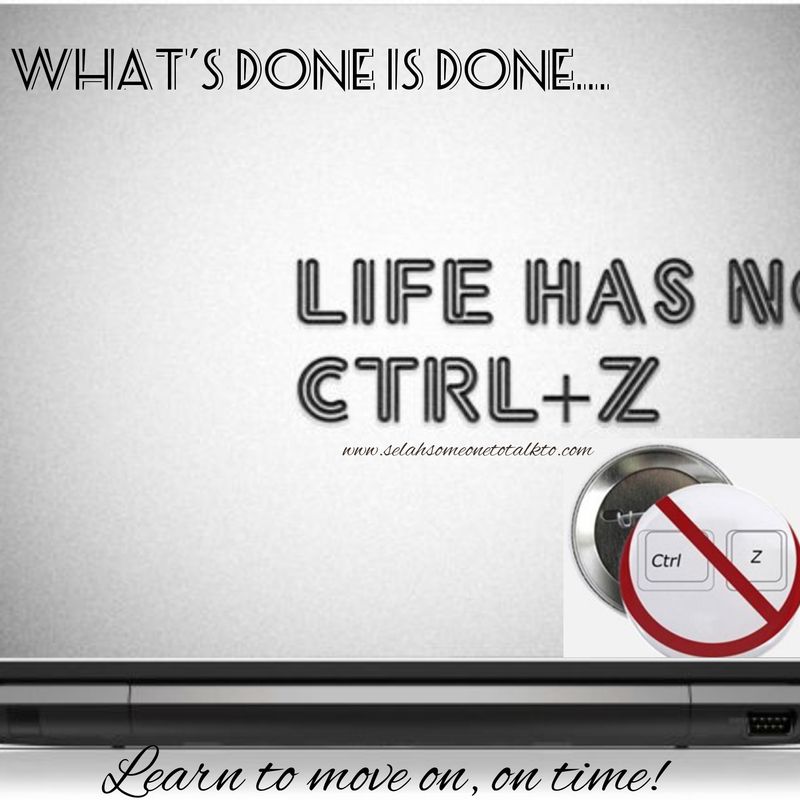 Stop wasting time wishing the undo button works, in real life that button is broken, you can only move forward. I know sometimes moving forward comes with heavy heart especially for people who are very emotional, like me but it is just one truth we must all learn to live with, what is done is done. People will want to tell you to think it through before you act, think twice before you decide but experience has shown that even with eyes wide open we can still fall into ditches. Some pressures are so real that only you know what you are feeling at the time and subsequent decisions you made afterwards. So it is done! In the end it happened, people will want you to feel guilty, yes you should be after all you got yourself into it but don’t get stuck in guilt land, snap out of it, you may not be able to go back and undo those decisions but you can most definitely fix yourself going forward. You can still be whoever you chose to be no matter what time of the day you realize it. Do you know that some times the route you went through that you are wishing you can undo are actually supposed to be an eye opener for you to see what your dreams entail? Do you know “in the valley of the shadow of death” are where most dreams are inspired? Even still at the jaws of death lies the sweetest of honey, Samson knows better. Rather than get grounded thinking how to undo what is done, keep yourself busy with what it has taught you, how you can solve same problems for others and how you can realign what’s remaining with where you want to be. The ‘undo’ button might be broken but the ‘fix it’ button is still working well. Stop wishing you can undo what is done, start fixing what is left of your life. And if you have resolved to make the required change, then now is the time; you don’t have to wait till morning, Monday, birthday or new year before you start something new, now is the best time of your life to do what must be done.